The design of the pre-fabricated pavilion is a fusion of design, lightweight engineering, and precision fabrication. It is a result of tight integration of computer-aided design, engineering and manufacturing. The strong silhouette of the pavilion, along with the careful coordination of features, materials, and colours is complemented by the bespoke design of the furniture. The design continues a rational, geometric production by embedding the tectonics of manufacture within the form itself. Defined by sophisticated digital processes, the structure has been developed in such a way that its components are, at most, singly curved. Innovations including planar forming were computer programmed to integrate fabrication constraints into the design while enabling engineering feedback in an iterative delivery process. This allows for comprehensive design development of complex and expressive form through the bending of flat sheet materials – a relatively simple process which produces very little material waste. This feature of the design assures the physical reproduction of the design from stock, flat, sheet material. The standardised material is bent into their final shapes taking advantage of ubiquitous manufacturing, cutting techniques enabling the fluid structural form with efficient production methods. Comprised of a series of structural bands collecting at the spine and expanding overhead, the patterning of the pavilion’s structure and shade structures are guided by the varied structural loading conditions. Through analysis of the geometry under load, the pavilion’s topology is digitally re-crafted and optimised to remove unnecessary material, resulting in the lightest possible design solution. Unsurprisingly, this organic structural logic recreates the very same principles found in nature. 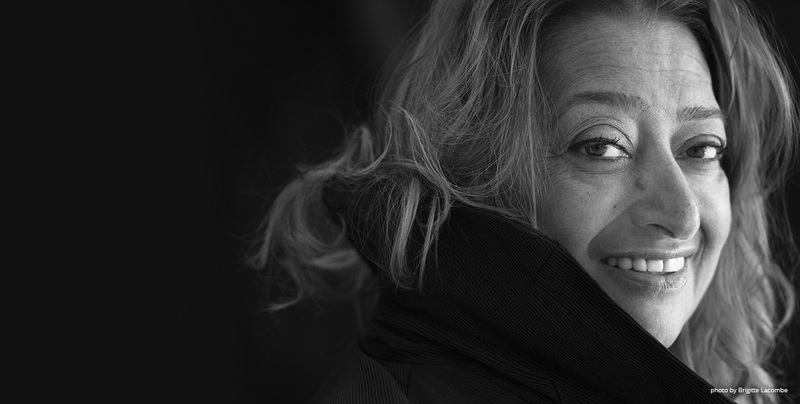 Zaha Hadid the first woman recipient of the Pritzker Architecture Prize and the first woman to be awarded the RIBA Gold Medal in her own right.